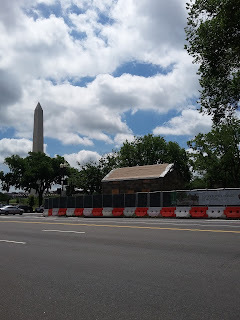 I've written in the past about the Lock-keeper's House, one of the oldest buildings on the National Mall in DC, and a remnant of DC's less glamorous past. It kind of looks like it's been patched up with cardboard and duct tape, though I'm sure that not what it is. Also, though the picture is bad, it says that the Lock-keeper's House is moving "only 50 feet." Which is good, I guess? It will at least get it away from the (very) busy street. I seriously want to do that someday.